$29 Million Deforestation Fines: Game Changer for Brazilian Soy Trade? Operation Soy Sauce has sent a strong warning signal to Brazil’s soy industry. At the end of May, five transnational grain trading companies, along with dozens of their supplying farmers, were issued fines totaling 105.7 million Brazilian reais (US $29 million) by IBAMA, the Brazilian Institute of the Environment and Renewable Natural Resources. The agency hopes the penalties will draw attention to illegal deforestation throughout the country, and make the soy sector more accountable for its failure to embargo crops from off-limit areas. The investigation, carried out jointly by IBAMA and the Federal Public Prosecutor’s Office (MPF), scrutinized the soy trade in the states of Maranhão, Tocantins, Piauí and Bahia, a region collectively known as Matopiba – the county’s latest agricultural frontier, and part of the Brazilian savannah biome known as the Cerrado. Currently, 11 percent of Brazil soybean production occurs in Matopiba, and more than half of its 337 municipalities have produced soy in the last decade. The Cerrado is rich in biodiversity, but its northern portion is rapidly being converted from native vegetation to agriculture, and the soy industry is expected to develop even further here in coming years. Cerrado deforestation is currently advancing quicker in the Matopiba states than any other part of the biome. “If there is no state action to inhibit this practice and prevent the arrival of these [embargoed] goods to the market, deforestation increases,” said Renê Luiz de Oliveira, head of environmental enforcement at IBAMA, in a statement. When the agency first noticed breaches of the embargo, it started its investigation into how the soy moved along the links in the productive chain. as well as learning the modus operandi for the illegal activities, he added. The new fines come amidst increasing tensions between conservationists and the agribusiness sector. The five transnational commodities companies – Cargill Inc, Bunge Ltd, ABC Indústria e Comércio SA, JJ Samar Agronegócios Eireli, and Uniggel Proteção de Plantas Ltda – were fined more than 24.6 million Brazilian reais (US $6.5 million) for acquiring roughly 49,000 bags, 60 kilograms (132 pounds) each, of soybeans produced in fields embargoed by IBAMA. Those IBAMA embargoed plots were areas in which farmers had cleared native brushland, while lacking licences to deforest, and where vegetation was supposed to be allowed to regenerate. “But sometimes farmers think they are not going to be checked, and continue farming there again,” explains Tiago Reis, a PhD researcher at Université Catholique de Louvain who studies agricultural supply chains. Non-compliance with environmental policies was found on 77 properties, using geospatial data. IBAMA’s investigation found that the trading companies had closed purchase deals with the farmers in anticipation of harvests, a common practice in commodities futures trading. “That means they [the traders] surely carried out financial risk assessments. No way they didn’t know that the soy was coming from embargoed areas – that’s even publicly available information,” Reis told Mongabay. “Or if they didn’t know, they didn’t pay attention,” says Mairon G. Bastos Lima, researcher at Chalmers University of Technology who works with TRASE, a platform that monitors global supply chains. Even though fines of US $6.5 million, split amongst five transnational commodities trading firms, will hardly make a difference in their company budgets, the penalties send a strong message to the sector: “It shows that the agencies are aware. Currently the actors on the ground act as if there was no one watching,” Reis explains. The amount of money fined is the least important aspect in this case, he adds. What counts is that these companies’ reputations are at stake. The IBAMA operation itself happened within the context of increased federal attention towards the Matopiba region, the “Wild West” of Brazil, as Bastos Lima calls it. “Fines need to be enforced in order for the whole system to work,” he says. The investigation took the Brazilian Agriculture and Livestock Confederation (CNA), representing farmers, by surprise. The CNA noted that satellite pictures are produced monthly, so violations should have been noticed immediately, and penalties ongoing, not delivered all in one batch this May. The CNA also argues that conservation should be the burden of society as a whole, and not laid on the shoulders of individual farmers. “It’s an imbalance, Everybody believes that preservation is important, but society has to assume a role there, not only farmers,” says Rodrigo Justus, environmental consultant at CNA. Conservationists, however, point out that large percentages of Brazil’s native vegetation, outside of the Amazon, is located on private property, which makes preservation and regulation challenging. “So it’s necessary that agribusiness players contribute to ecosystem conservation, at least to the level mandated by law,” says Bastos Lima. Key to ensuring this happens is the further development of sustainable supply chains in order to conserve the Cerrado. All participants in the chain of production, marketing and trading have to strictly be held accountable, agree environmentalists. For IBAMA that means correct market controls, says Luiz de Oliveira, head of environmental enforcement at the institute. Unfortunately for IBAMA, the issuance of the fines came at a bad moment, as a national strike by truck drivers paralyzes the country, an event that concerns the commodities companies and attracts the Brazilian public’s attention far more than the soy fines. “The fines don’t receive as much attention as they might have otherwise,” says Reis. At the same time, he adds, the soy industry has been largely responsible and careful not to violate environmental laws, as compared to other agricultural sectors. While IBAMA’s penalties against soy producers are a novelty, fines occur regularly with the beef sector, for example. In total, all phases of Operation Soy Sauce resulted in the seizure of 84,024 bags of soy –5,041 tons in all, IBAMA stated. In addition to the fines, the MPF has announced that it will propose a public civil action targeting the addressed offenders and requiring that they repair all environmental damages caused by the illegal activity. Asked for a statement, Bunge replied that it disputes the allegations and has filed a response to IBAMA contesting the findings. “We intend to pursue all available channels to clarify this matter,” the statement reads. The same goes for Algar Agro (the new name for ABC Indústria e Comércio SA). The firm says it has already presented its defense, and has proven that it follows best practices in the purchase of grains. Cargill answered inquiries by reaffirming that the company has internal processes and controls to avoid purchases from embargoed areas. The firm said that facts related to the notice are under review, and appropriate measures will be taken to address the matter. Concerned about the implications for its reputation, Uniggel Sementes, responded that the company Uniggel Proteção de Plantas Ltda – fined more than 13 million Brazilian reais (US $3.5 million) for the purchase of 26,510 bags of soybeans in Tocantins – is not associated with the Uniggel brand, despite it carrying the Uniggel name. While some analysts see the fines as a valuable conservation tool, they note that ongoing agricultural expansion in Brazil has far-reaching implications for the surrounding landscape. “Companies keep talking about responsible soy production, but the very model of industrial agriculture is built on a foundation of deforestation and land conflicts,” Devlin Kuyek from GRAIN, and NGO, says. Expansion of soy production inevitably brings with it many problems for neighboring communities, including deforestation and a decrease in water resources. “It is a very unsustainable model, part of a big global supply chain,” he says. Business as usual versus conservation? Agribusiness constitutes a vital part for the Brazilian economy, comprising 23.5 percent of the country’s GDP in 2017 and 36 percent of its exports. Soy specifically, makes up nearly 12 percent of the nation’s exports, accounting for an estimated US $25.7 billion in 2017, up from US $19.3 billion the year before. 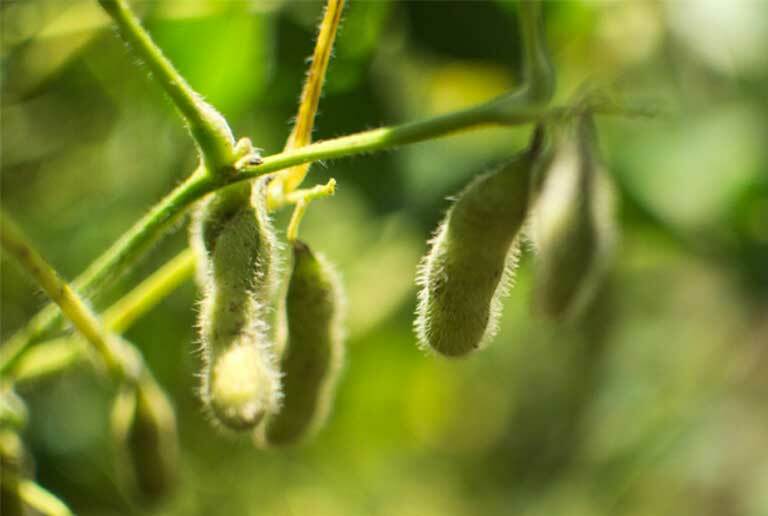 This year Brazil is expected to outperform the United States, becoming the world’s largest soybean producer. In 2017, Brazil exported 68.1 million metric tons – a volume that has been increasing steadily over the last decade. This makes soy one of Brazil’s most valuable export commodities. The lion’s share of Brazilian soy flows to China, but also Spain and Germany, as tracked by TRASE. However, this explosion in Brazilian production, especially in the Cerrado, could be managed in a more sustainable way, says Bastos Lima. He points to the many zero-deforestation commitments that big commodities trading houses have signed themselves up to in the past, such as the largely successful Amazon Soy Moratorium.